What Kind of Candy Does Your Dentist in Sachse Give Out on Halloween? Halloween is an exciting time filled with ghosts, goblins, and treats! It’s also a time for tooth decay, cavities, and fractures for your teeth if you’re not careful. 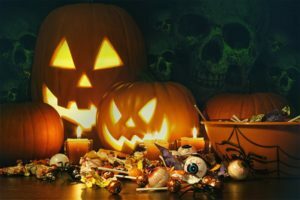 Your dentist in Sachse has some advice on which goodies cause more problems and how to enjoy this Halloween season while avoiding damage to your teeth. Sticky, chewy, and gummy candies. These types of treats stick to your teeth and tend to linger longer than they should. This allows sugar a longer time and better chance of causing damage to your teeth. Sour candy. This type of candy presents a triple whammy for your teeth because it tends to be sticky, coated in sugar, and highly acidic. It’s best to stay away from sour candies. Hard candies. These candies also are double-edged sword. They allow sugar to linger in your mouth as they take their time to dissolve. If you choose to bite into a hard candy they can actually fracture or crack your tooth. If you’re going to partake of these types of candy be sure to brush shortly after. Wait at least 30 minutes to brush after sour candies as the acid breaks down tooth enamel and vigorous brushing can cause more damage to your teeth. Chocolate is your best choice when it comes to Halloween candy, especially dark chocolate as it contains less sugar than milk chocolate. It’s also easier to wash off of your teeth than other types of candy. Handing out small gifts such as pencils or fun shaped erasers is also a good alternative to candy. Be creative when it comes to Halloween treats and have a safe and happy holiday season! Dr. Travis Rottman has been serving patients in Sachse, Wylie, Murphy and the surrounding communities for over 5 years now. Patients enjoy high quality, comprehensive dental care in a warm and friendly environment when they choose Sachse Family Dentistry as their dental home. If you would like to contact Dr. Rottman, he can be reached by calling 972-848-0073, or through his website. Comments Off on What Kind of Candy Does Your Dentist in Sachse Give Out on Halloween?